When lemons are in abundance, there is nothing like a nostalgic lemon cake. This is perfectly tart yet sweetened ever so slightly by the maple syrup and has a moist pillowy centre. This recipe will also work beautifully with other citrus such as limes or oranges. Preheat your oven to 160C. Line a 20cm round cake tin with baking paper. Add the oil and sugar to the bowl of a stand mixer fitted with a whisk attachment. Whisk for 5-8 minutes on medium speed until the mix is pale and slightly thickened. Add the eggs one at a time, whisking well between each addition. Pour in the lemon juice, zest, and yoghurt. Whisk for a further minute. In another bowl, sift the flour and baking powder together. Then add this to the wet ingredients. Mix everything on slow speed until it has just combined. Be careful not to overmix it. Once combined pour into the prepared tin and place a few fresh raspberries on the top. Bake for 1 hour 10 minutes or until a skewer inserted into the cake comes out clean. To make the syrup, add the lemon juice, maple syrup, and cinnamon to a saucepan and bring to a boil for 5 minutes. Leave the cake in the tin to cool slightly then stab little holes all over it with a skewer. 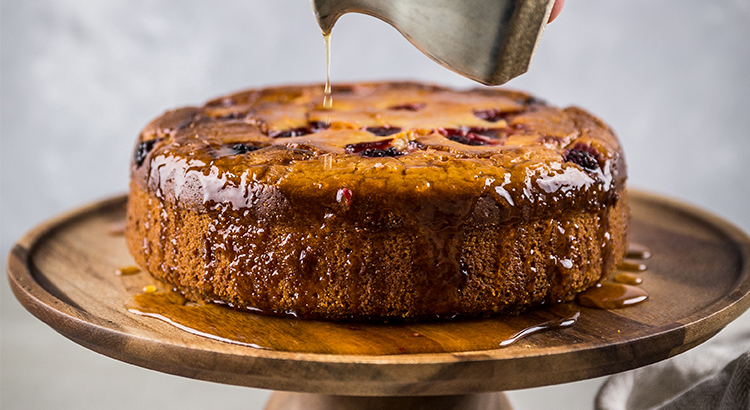 Pour the lemon and maple syrup all over the cake, making sure all those little holes fill up. Once the cake has cooled down and has absorbed the syrup, remove it from the tin. Jade is mum to two little boys and a passionate home cook who loves wholesome food and a good dinner party.